Megan and Rijo met in 2014, got engaged the summer of 2017, and were married in May 2018. 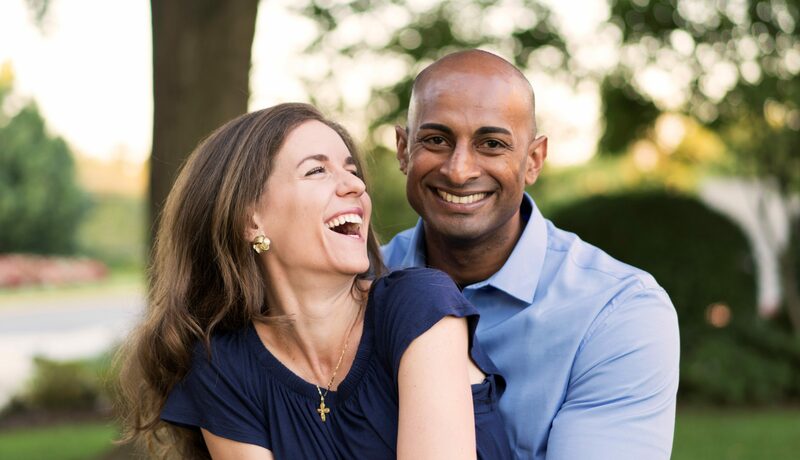 Here they share their experience of marriage preparation, wedding planning, and growing together as a Catholic married couple. In the last few weeks, Rijo and I have taken a few trips up to New York to meet with a dear friend and priest, Fr. Roger, who is preparing us for marriage. I’ve seen this time as a sort of peek into the “foxhole” of marriage: how we will battle the various challenges and embrace the joys that God offers us as a married couple. We spent a good part of the time driving up highway 95 from Washington, DC chatting about the topics we would cover – everything from finances and communication styles to prayer and how we might raise children. On the way back, we took time to share how we might put into practice what we had discussed and learned. Throughout this time, there have been 5 things that have stuck out to me as key “take-aways” from our time in marriage prep. 1. Talk to other couples. I can’t stress enough how much it has helped us to talk with married friends and other couples about their own experience of marriage. I treasure the pearls of wisdom I’ve received from these couples we admire. My aunt and uncle reminded us that we don’t have to resolve every conflict (any other idealists out there? ), and they showed us ways to express trust and teamwork in family finances. My newly married friends have offered advice on honeymoon planning, what to expect in the first year of marriage, and insights from their own engagement time. Find a time and place together to be free from distraction. Open with a short prayer to God for the relationship. One of the spouses begins by praising and thanking the other for anything that has been meaningful and appreciated since our last “sit down.” It can be big or small, something that the other does every day or one specific action that was meaningful. I’ve learned more in this time about what makes Rijo feel loved by me (a step beyond learning the Love Languages which we’ve also found very helpful), and this practice ensures that we don’t take each other for granted. That spouse ends by sharing anything that the other might have done that was challenging or hurtful. At first this part of “sitting down” really freaked me out. But when this time follows a period of praise and affirmation, it puts the little imperfections in the context of all that is already so good. I also think new couples (read: me, myself, and I) can sometimes overreact when they are not 100% on the same page about something. By having a set time regularly to bring up little points of contention, it prevents us from overreacting to every little thing that comes up. We might also find that some things turn out to correct themselves or be nothing at all by the time the discussion takes place. Then the couple switches and the other person shares. It’s great! I have to say that this has been a tremendous tool to help me refocus on what is most important during a time when it can be tempting to get sucked into the busyness of life, like wedding planning! 3. Share the fruits of your prayer. I’ve come to appreciate the fact that in marriage, the union that exists between husband and wife is beyond just the physical and the emotional…it’s also spiritual. The graces given to one affect the other. We are learning to reinforce this in simple ways: sharing one thing that struck us at Mass that day, and alternating at the beginning of each decade of the rosary (when we pray it together) to suggest what to reflect on in that Mystery. 4. Approach conflicts with a sense of humor. We’re not perfect, and we never will be. We will say the wrong thing at the wrong time or take things personally when we shouldn’t. Mark Twain said that “humor is the good-natured side of a truth.” If we can find the humorous side of a miscommunication or a point of tension…things are resolved much sooner. 5. Reverence for the Sacramental Bond. This is less quantifiable but perhaps the most important aspect of marriage prep for me. We have been encouraged to think and pray about how marriage is first and foremost God’s work in us. As we get closer to our wedding day, I take great joy and comfort in knowing that God is preparing to unite us in His Love. He promises to bestow His life, love and grace upon us through each other. The marriage prep process is challenging me to mature in the way I love Rijo and entrust our future together to God’s providence. I’m grateful I have a great partner at my side “in the foxhole” as we prepare to enter into this beautiful sacrament. Lifelong marriage is still the ideal. What gets in the way of this commitment?